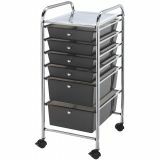 Blue Hills Studio Storage Cart - BLUE HILLS STUDIO-Storage Carts. These rolling carts are ideal for storing large and small tools, embellishments, punches, stamps, paper and more. The chrome frame and locking swivel casters are sturdy and stylish combined with the smoke colored or multi-colored drawers. This cart contains six drawers: four small (2-3/4x10-1/2x14-1/2in and two large (5-1/8x10-1/2x14-1/2in). Cart measures 31.9x13.2x15.4in, is constructed of metal and plastic and requires quick and easy assembly. Colors: chrome frame with either multi-colored or Smoke colored drawers (each sold separately). Imported.